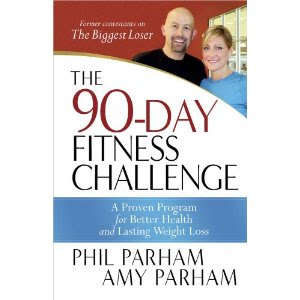 I mentioned previously that I was starting the The 90-Day Fitness Challenge , by Phil and Amy Parham, who were Season 6 contestants on The Biggest Loser. Due to going out of town and not keeping track of the days while vacationing a big with my family and then on the trip to New York, I'm on Day 24. (It's probably supposed to be something like Day 40 but whatever.) Progress is progress, right? 4. Have dropped a couple of pounds. Not too shabby, I think. Mostly, my goal is to be healthy. I've also never really read any health care books in the past that I can recall so it's been good to delve into the The 90-Day Fitness Challenge . The book has now released (it released on June 1st) but there is still a DVD to come! I'll post a more thorough review of this workbook and the DVD itself when it releases in July. So stay tuned. Just thought I'd let you know I'm still stickin' with the program and finding it intriguing. I just started doing Jillian's 30-Day Shred. Oh.my.goodness! It's tough! I've started reading Real Food by Nina Planck. It's eye opening. I'm not sure Bob & Jillian would agree with her whole-food approach, though. I'm on the library waiting list for Jillian's Master Your Metabolism Cookbook. Looking forward to reading what your nutritionist has to say. They were on before I started watching, so I am not familiar with them, but I am glad to hear more about this book. I wish the Biggest Loser would share more educational tips about diet and fitness and focus less on the "drama," but I do enjoy the show. I'm on a similar journey this summer - get myself healthy. We bought pedometers which help motivate me to move. I also started Jillian's 30-Day Shred. Melissa is right - it's tough!! I've yet to do the entire Level 1 workout without taking a break. But, like you said, some progress is better than no progress. We are also changing our eating habits. Meeting with a nutritionist is a great idea! AND you got me hooked on Biggest Loser! Don't tell me who wins - only 2 more episodes left!! You are right that it is motivational to watch people changing their bodies and lives. I keep thinking that you don't become obese all at once. It takes a lot of little choices which add up. A pound here, an extra bagel there. So, where did you find past seasons to watch? Admittedly, I ordered Season 6 on Amazon. You can just click and order and watch the episodes through there because watching the latest season was so...motivational...I thought following up and seeing who Phil and Amy are would be both interesting and fun. But I don't like the contestants on Season 6 so very much and it's harder to make it through the season when everyone is bickering and complaining at one another. I liked the Season 9 contestants better (at the tail end, esp.) because they were working for and with each other and it wasn't so exhausting emotionally. As Barbara mentioned - drama anyone? !